See below for links to past event photos! For Professional Photo Op Pics: If you ever want the full HQ professional photo op digital picture from your event, email and attach the picture you want to hello@cravesportsco.com and we will email it back to you. You can also shop past events if we had extra items done. Client Mike Hughes autograph signing hosted by A Rising Star on July 21, 2018. We at Crave Sports Company authenticated all back stock items as well as customer items. Money Raised for Children's Hospitals & Clinics of MN & Other Charities! Joe Senser pictured with Jerry Kill, December 10, 2016. ATHLETICS ROOKIE SLUGGER RYON HEALY! CHICAGO CUBS ROOKIE CARL EDWARDS JR! 2016 VIKINGS DRAFT PICKS KENTRELL BROTHERS & WILLIE BEAVERS! FORMER GOPHERS KJ MAYE, ERIC MURRAY & DE'VONDRE CAMPBELL! MINNESOTA WILD STAR MATT DUMBA! January 11, 2016 Public Autograph Signing with Wild Star MATT DUMBA! Click here for event photos! Click here for extra autographed Dumba items! MINNESOTA WILD YOUNG GUN CHRISTIAN FOLIN!! December 20th, 2015 Public Autograph Signing inside our Crave Sports store at Southdale Center! Click for event photos! Click here for extra autographed Folin items! MINNESOTA HOCKEY LEGEND LOU NANNE!! December 19, 2015 Public Autograph Signing inside our Southdale Center location! Click for event pictures! November 21st, 2015 Public Autograph signing inside our store at Southdale Center in Edina, MN! Click for pictures! Click here for extra autographed Foreman items! VIKINGS GREATS DARRIN NELSON & CARL LEE!! November 14th, 2015 Public Autograph signing inside our store at Southdale Center in Edina, MN! WILD STAR & FORMER GOPHER THOMAS VANEK!! November 3rd, 2015 Public Autograph signing inside our store at Southdale Center in Edina, MN! Click here for photos! Click here for extra autographed Vanek items! BRONCOS 2015 #1 DRAFT PICK SHANE RAY! October 20, 2015 Autograph Signing with Shane Ray downtown Denver! Click here for photos! Click here for extra autographed Ray items! September 23 Gerald Hodges autograph signing event photos have been posted! Click here for photos! TWINS PITCHERS GLEN PERKINS & TREVOR MAY! August 15th Glen Perkins & Trevor May Event Photos Album has been posted! Click here for photos! Click here for extra autographed Perkins & May items! VIKINGS 2015 #1 DRAFT PICK TRAE WAYNES! July 23rd, 2015 Trae Waynes Autograph Signing! Click here for photos! Click here for extra autographed Waynes items! 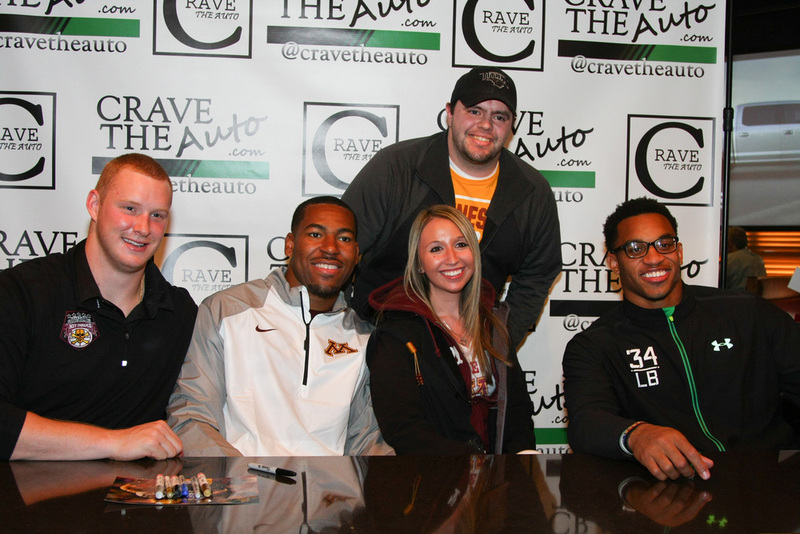 MAXX WILLIAMS, DAVID COBB & DAMIEN WILSON!! Post by CRAVE the Auto. Visit our facebook pages for all viewing galleries.